Sometimes called "grilling medallions," beef top sirloin steak medallions are ideally suited for a fast meal. 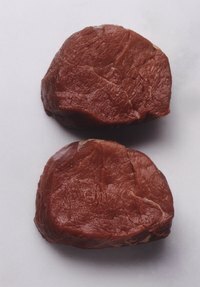 These individually portioned steaks are best cooked quickly at high temperatures, either on the grill or the stove. You can season the steaks simply with just salt and pepper, but top sirloin cuts benefit greatly from marinades. Sirloin steaks absorb flavors well and marinades tenderize the meat, which can be be tougher than some other cuts. Sirloin medallions cook in under 10 minutes, so prepare your side dishes before beginning the steaks. Heat a few tablespoons of oil in a large skillet over medium-high heat. Pat the medallions dry and season both sides liberally with salt and pepper, or remove them from their marinade, if using. Place the steaks in the skillet when the oil begins to shimmer. If necessary, cook the medallions in batches to avoid overcrowding the pan, which will prevent the steaks from achieving a well-browned crust. Cook the medallions until they reach your desired level of done-ness. Sirloin medallions 1 inch thick will require about 3 to 4 minutes per side to reach 130 degrees Fahrenheit for medium-rare. Transfer the steaks to a plate or cutting board and allow them to rest for 5 minutes before serving. Resting the steaks helps them retain their juices while the internal temperature continues to rise about 5 degrees. Prepare your grill for medium-high heat. Clean the grill grate and lightly brush it with oil to prevent the steaks from sticking. Season the medallions with salt and pepper, or remove them from their marinade, if using. Place the medallions on the grill directly over the heat source and cover. Cook the steaks until they reach your desired level of done-ness, about 3 to 4 minutes per side for medium-rare, 1-inch-thick medallions. Remove the steaks from the grill and allow them to rest for 5 minutes before slicing. Store-bought salad dressings make effortless marinades, but you can make your own by mixing oil with an acid like balsamic vinegar or lemon juice and flavorful aromatics such as garlic, shallots and fresh chopped herbs. Marinate sirloin medallions for up to 24 hours before cooking. If you skip marinating, try rubbing the steaks with a crushed clove of garlic before cooking for extra flavor. For best results, use an instant-read thermometer to accurately gauge the meat's temperature. Although some cooks prefer their steaks cooked rare or medium-rare, the U.S. Department of Agriculture recommends cooking whole cuts of beef to a minimum internal temperature of 145 F to ensure safety.